How Much Life Insurance Does a Stay-at-Home Spouse Need? - Joseph W. McCartin Insurance, Inc.
How Much Life Insurance Does a Stay-at-Home Spouse Need? A stay-at-home spouse is vital to the family unit, but often the financial impact is overlooked if something were to happen to that person. Choosing the best life insurance plan for a stay-at-home spouse is a proactive way to protect against financial hardship when they’re gone. Little research exists that quantifies the value of a stay-at-home parent. In a 2016 Mom Salary Survey report, the most common functions performed by the non-working parent would translate to a $48,509 base salary and $94,593 in overtime, for a total of $143,102. It further states that stay-at-home spouses work 92+ hour weeks, serving as a housekeeper, childcare provider, cook, psychologist and carpool driver, among numerous other tasks. Now that we have a better understanding of the quantitative value of a stay-at-home spouse, how do we determine what plan is best for your family? The total of an individual’s annual salary multiplied by the number of years before the youngest child is out of college is a good starting point to determine the appropriate amount of insurance protection that is necessary. 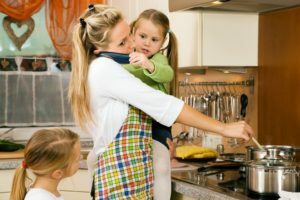 For example, if the value of the services a stay-at-home spouse provides equals $50,000 a year, and the youngest child will finish college in 15 years, then the appropriate amount of insurance protection needed would be approximately $750,000, depending on other available income or resources. We never overlook the care and hard work that stay-at-home spouses provide the family, household and community. Since the loss of a parent produces an inevitable emotional and financial burden on a family, you shouldn’t overlook the need for life insurance to protect stay-at-home and working parents alike. Learn more about life insurance options here.